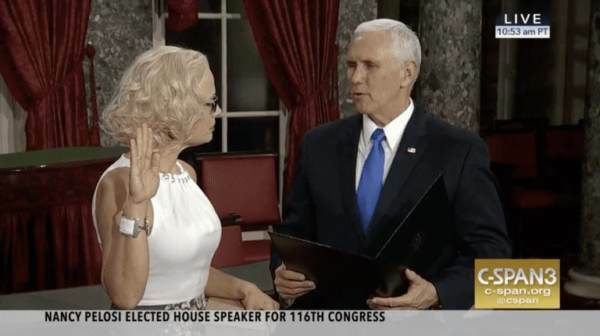 Newly-elected Democrat Arizona Senator Kyrsten Sinema, was sworn in on Thursday and refused to take her oath on the Holy Bible. Ms. Sinema opted to be sworn into office by placing her hand on a copy of the US Constitution and the Arizona Constitution, reported AZ Central. Sinema is a radical Code Pink activist and a Taliban sympathizer who won the Arizona Senate race against Martha McSally after thousands of votes appeared post election day. The newly elected Arizona Senator is openly bisexual, making her the second member the Senate to be a part of the LGBTQ community. Two Muslim Democrat lawmakers in the House were sworn into office Thursday with a Quran rather than a Bible. Previous Previous post: Ocasio-Cortez Gets Nasty With Steve Scalise, Her Supporters Threaten Him. His Response Is Perfect. Swear on a Bible – or not at all!